Simple, fashionable, comfortable and practical - Sunlight A12 provides you with a quiet and comfortable listening experience. ★Our bluetooth headset adopt bluetooth 4.1 technology - Equipped with Smart CSR chip, APT-X audio decoding technology,support HSP, HFP, A2DP,very easy to pairing bluetooth device ,and Bluetooth earpiece with mic supports SIRI voice prompt and mute switch, one key to Power on and enter pairing mode.Supports Multipoint Technology Can connect to two different devices in 10 meters range simultaneously. 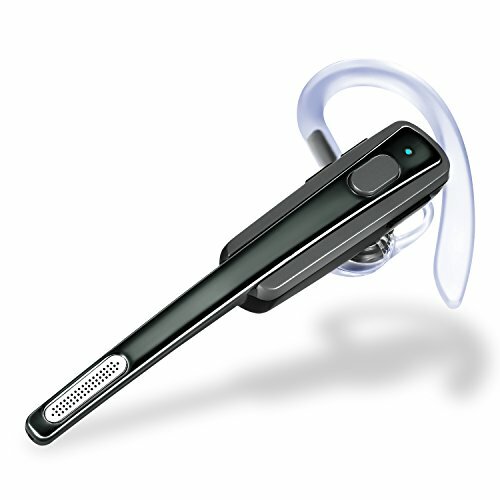 ★Our Bluetooth Earpiece can gives you a fast Bluetooth connection on your device with high performance audio system that delivers HD pure sound quality.This captured high treble and deep bass of your favorite songs with clarity and precision with a comfortable ear tips that perfectly fits on your ear. ★Soft silicone earplugs for comfort.The rotatable earhook allows you to wear it on your left or right ear without worrying about falling off. One Key to activate (Siri) Voice assistant and Mute function---Mute Button. ★A quick double click will dial your phone's last number. ★You will hear a voice prompt "Disconnected" when you are out of 33ft bluetooth range. Enjoy Freedom of Soundfor an Active Lifestyle - Add to cart and ORDER NOW! Bring ear hooks, sound effects will be better. 【Ultra high configuration and refreshing sound】: This headset uses CSR chip, built-in CVC6.0 HD microphone, Bluetooth V4.1+EDR APT-X audio decoding technology. It gives you a stable signal and a loud and clear sound. It can be seamlessly connected with everyone at any time and in any environment, allowing you to enjoy music and free talk. 【Powerful functions】:This Bluetooth headset supports Mute function during calls as well,supports Siri voice prompt.Allow two Bluetooth devices to connect at the same time.Bluetooth V4.1 headset supports Calling and Music Playing function, easy and fast pairing with smart phones and tablets, compatible with iPhone(X), Android, and Other Leading Smartphones.With 33ft (10meters) Bluetooth working range.If not bluetooth enabled, need to add a bluetooth adapter/Dongle. 【Perfect design】: Smooth lines, stylish appearance, make people shine. The scientific structural design is fully ergonomic, ultra-lightweight (0.36 ounces) and soft silicone earplugs for comfort. The rotatable earhook allows you to wear it on your left or right ear without worrying about falling off. 【Supper long battery life】:Optimization of circuit design,rechargeable lithium polymer batterier,supper long standby for 180 hours ,6-8 hours working time ,1.5 hours fast charge.Please Note: 5V Charger Only. Overvoltage will damage the Bluetooth earpiece. 【Our commitment】:We offers 30 days money back & 12-month worry-free guarantee. YOUR SATISFACTION IS OUR GOAL. YOUR SUGGESTION IS OUR MOTIVATION.24 Hrs customer service support，welcome to contact us,our excellence service will bring you a smile. If you have any questions about this product by MINI, contact us by completing and submitting the form below. If you are looking for a specif part number, please include it with your message.